For Baudolino, patron saint of Alessandria, see Saint Baudolino. 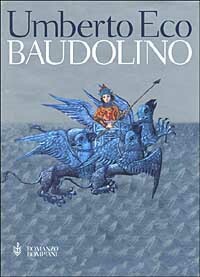 Baudolino was translated into English in 2001 by William Weaver. The novel presented a number of particular difficulties in translation, not the least of which is that there are ten or so pages written in a made-up language that is a mixture of Latin, medieval Italian and other languages (intended to reconstruct how a barely-literate Italian peasant boy of the 12th century would have tried to write in the vernacular). In the year of 1204, Baudolino of Alessandria enters Constantinople, unaware of the Fourth Crusade that has thrown the city into chaos. In the confusion, he meets Niketas Choniates and saves his life. Niketas is amazed by his language genius, speaking many languages he has never heard, and on the question: if he is not part of the crusade, who is he? Baudolino begins to recount his life story to Niketas. His story begins in 1155, when Baudolino – a highly talented Italian peasant boy – is sold to and adopted by the emperor Frederick I. At court and on the battlefield, he is educated in reading and writing Latin and learns about the power struggles and battles of northern Italy at the time. He is sent to Paris to become a scholar. In Paris, he gains friends (such as the Archpoet, Abdul, Robert de Boron and Kyot, the purported source of Wolfram von Eschenbach's Parzival) and learns about the legendary kingdom of Prester John. From this event onward, Baudolino dreams of reaching this fabled land. The incident of the death of Emperor Frederick, while on the Third Crusade, is a key element of the plot. This part involves an element of secret history – the book asserts that Emperor Frederick had not drowned in a river, as history records, but died mysteriously at night while hosted at the castle of a sinister Armenian noble. This part also constitutes a historical detective mystery – specifically, a historical locked room mystery – with various suspects suggested, each of whom had a clever means of killing the Emperor, and with Baudolino acting as the detective. After the Emperor's death, Baudolino and his friends set off on a long journey, encompassing 15 years, to find the Kingdom of Prester John. From the moment when they depart eastwards, the book becomes pure fantasy – the lands which the band travels bearing no resemblance to the continent of Asia at that or any other historical time, being rather derived from the various myths which Europeans had about Asia – including the aforementioned Christian myth of the Kingdom of Prester John, as well as the Jewish myth of the Ten Lost Tribes and the River Sambation, and some earlier accounts provided by Herodotos. Baudolino meets eunuchs, unicorns, Blemmyes, skiapods and pygmies. At one point, he falls in love with a female satyr-like creature who recounts to him the full Gnostic creation myth; Gnosticism is a pervasive presence in another of Eco's novels, Foucault's Pendulum. Philosophical debates are mixed with comedy, epic adventure and creatures drawn from the strangest medieval bestiaries. After many disastrous adventures, the destruction of Prester John's Kingdom by the White Huns followed by a long stint of slavery at the hands of the Old Man of the Mountain, Baudolino and surviving members of his band of friends return to Constantinople undergoing the agony of the Fourth Crusade – the book's starting point. The wise and rather cynical Niketas Choniates helps Baudolino to at last discover the truth about how the Emperor Frederick died – with shattering results for Baudolino and his friends. Various strange characters figuring in the novel as rendered in the Nuremberg Chronicles. These creatures and many others were all described and named by Pliny the Elder in his Naturalis Historiæ from 77 AD: A monopod and a satyr (top); a blemmyae and a panotti (above). Baudolino – young man of Alessandria, protagonist, apparently a reference to the patron saint. The monopod Gavagai, a reference to Quine's example of indeterminacy of translation. Deacon John, leprous sub-ruler of Pndapetzim, apparently based on Baldwin IV of Jerusalem.